Most of the time TimeMachine works well in the background. The only point you may recognize it is the temporary performance loss if the backup is running. Problem: Time Machine and the connected Time Capsule assume, that there is a backup process still running. In my case, a cold (but necessary) restart of my Mac was the reason for the confusion. Solution: Unfortunately a restart of my Mac did not help. The problem is the Time Capsule itself, which has to release the established connection. You can fix that problem with the AirPort Utility under Programs/Utilities. 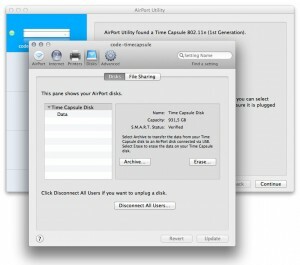 The brand new AirPort Utility Version 6.1 has only one function you can use: The restart of the Time Capsule. But that did not help in my case. Weird but true: the old AirPort Utility Version 5.6.1 comes with much more features … especially “Disconnect all users …”. This is exactly what we need to solve our Time Machine error! So you just need to open the 5.6.1 version of the AirPort Utility, open the Time Capsule with a double click and open the tab “Disks” and press the button “Disconnect all users …”. In order to solve the problem like I described before, I had to work around an other problem: How to install the old AirPort Utility version 5.6.1 on my Mac running OSX 10.8 Mountain Lion?! The old AirPort-Utility version works well under 10.8, but the installation routine will not allow to install it. Luckily, Frank Tisellano helps us out with am Automator workflow to extract the App from the installation bundle. In my case I had to open the “AirPort Utility Extractor” Skript in Automator to run the commands in the terminal manually. Apparently in Airport Utility 6.0 you can Edit your TC settings, go to disk, and deselect “Enable file sharing”, then Update. The TC will reboot and all connected users will be disconnected. Check your backups now occur then you can re-enable. I had to restart after disabling file sharing in Airport disk tab. 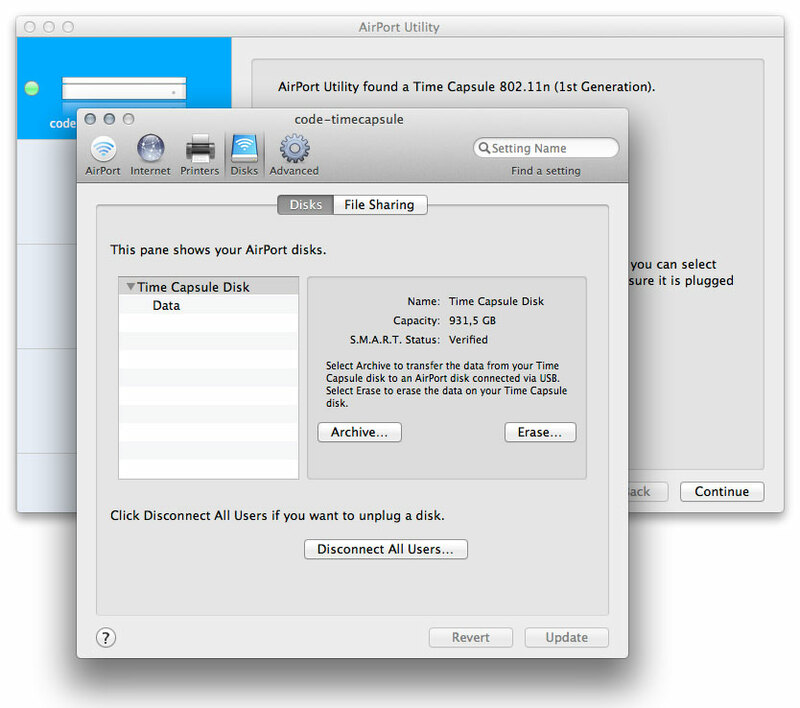 Then was able to re-enable the file sharing, otherwise Airport could not find my Time Capsule. Or you could just turn your TM off then on again! It worked for me. Worked great for me. Thanks so much! I restarted my airport extreme and that did the trick for me. Was an option under Base Station once I selected to edit it. Thanks for the posting here, helped me get to this! Disabling File Sharing, Rebooting the Airport Extreme, and then re-enabling file sharing followed by starting the back up worked for me! Thanks so much. Thanks Christian! That seems to have done the trick! Thank you for this. I’ve been having the same problem on and off for months. This forum is excellent! My airport utility updated and when I go into it, all I get is “Searching for base stations.” Not sure how you are able to disconnect all users. I’m having the same problem with my back ups. YEAH! After multiple search attempts the solution to “disable file sharing” solved it for me on El Capitan OS X 10.11. Finally I can use Time Machine again!